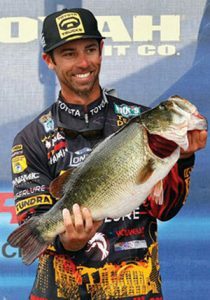 The swinging jig — made popular by Bassmaster Elite Pro Tommy Biffle — is a serious fish catcher. My guess is that’s because it’s a darn near perfect imitation of a baitfish rooting on the bottom. Every angler should have a handful of them in his or her tackle box. There are dozens of different makes and models out there. Some have traditional round heads and some have football heads. Each has its place. But I think a head that’s somewhere in the middle is the best all-around option. That’s what I want, anyway. That was the idea behind our VMC Swinging Rugby Head. Our head design will work under a wide variety of conditions and bottom composition, and our recessed line tie protects your knot when you’re fishing in tough conditions. Beyond that we offer it in three colors, five weights and two different hook options—one an offset worm style and the other has a straight shank with a bait keeper. This bait has plenty of built in action. You don’t need plastic trailers with curly tails, a dozen feet or two dozen arms and pinchers. I fish mine about 90 percent of the time with a Berkley HAVOC Devil Spear. Its gentle ripple is action enough. Fish it fast. This is not a slow, finesse lure. Fish it fast and make sure it bounces off the bottom. Slow down only if it starts to lift up off the bottom. Think crash and burn with this baby. Go heavy. A swinging jig needs to be on the bottom, like I just said. Therefore you should always go as heavy as possible depending upon the water depth. If it starts to lift up off the bottom, let it fall back down. This bait is not designed to swim in open water. Concentrate on hard bottoms. This lure works best when it’s bouncing off rock, sand and gravel. Concentrate your efforts in those type areas. 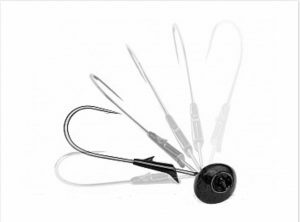 Swinging jigs have a place in every angler’s arsenal. Make sure they’re in yours. and upcoming Going Ike episodes on YouTube.